Keeping your home in good repair is essential to help maintain its value, appearance, and function. Some projects, however, may be beyond the scope of what you're comfortable doing. You may not have the right tools, or perhaps you don't have experience with a particular repair or renovation. That's when it's time to call on a Sears Handyman. Our technicians can handle many minor to intermediate repairs and tasks, including fixing plumbing problems, fencing installation, and even mounting your new flat-screen TV. Give us a call at (619) 852-9292. Many homeowners are understandably uncomfortable performing electrical maintenance in their homes. Sears Handyman Services is ideal for minor problems that don't require a professional electrician. We can repair and fix ceiling fans and lighting fixtures and help brighten and upgrade your home's appearance by installing recessed or LED lighting. Drywall is used as a construction material in most modern homes, often in interior walls and ceilings. It's a sturdy, versatile product, but it can suffer damage if a doorknob or other object hits it. In addition, it can look less attractive after you use nails to hang art and other decor. Sears Handyman Services can hang drywall and also repair drywall. We can handle minor or major projects. A deck is subject to the effects of rain, sunlight, and even snow and ice over the years. This can affect its appearance, making a once-new deck look stained or faded. Some damage, such as rotten or loose boards or rusted nails, can compromise your deck's safety and put your family and friends who use it at risk. Our Sears Handyman technicians can build a new deck to improve your home's value and extend your outdoor living space, and they can repair or stain and treat your deck to ensure that it's safe and continues to look attractive. Fencing comes in a variety of attractive, versatile materials and helps delineate your property lines. It also helps increase your privacy and gives your children and pets a safe place to play. Our technicians can install new fencing, including picket or chain link fencing in a wide array of materials to match your needs and budget. A fresh coat of paint is one of the most cost-effective and quickest ways to transform your home's interior and exterior. However, the work can be difficult and time-consuming, and you may have to remove existing wallpaper before you begin. You may also have to climb a very high ladder to reach ceilings, which can be dangerous. 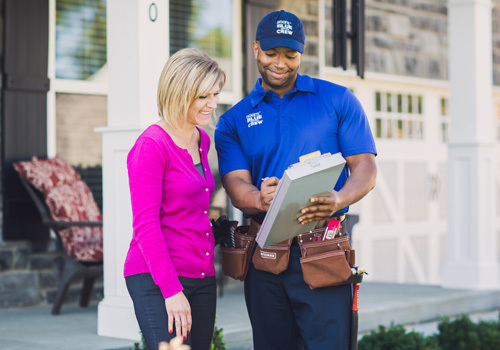 Let a Sears Handyman handle the job for you and have the job professionally and safely done.